What if you didn't have to mess with RGBx LEDs and complex driver electronics to warm an LED's light as it dims? Researchers in the Netherlands have an elegant solution. We have written a good deal about dimming to warm -- a feature in which an LED-based lamp or engine mimics an incandescent or halogen and drops in CCT as the light dims. As far as I know, every LED product or prototype that does this uses several LEDs -- at least red-green-blue, possibly also white or amber -- and a sophisticated, proprietary driver that controls them to obtain the desired dimming curve through color space. At low current, the coated LEDs emit a cozy, warm glow compared to uncoated reference LEDs. These multiple LEDs, especially the control electronics, add volume, heat, complication, and cost to SSLs. What if dim-to-warm could be accomplished in a simpler way? That's the question researchers at Philips Research Eindhoven and the Eindhoven University of Technology asked themselves. They came up with a simple and elegant solution that may be a mere two years from commercial realization -- a "smart single white light LED." Jurica Bauer, Hugo Cornelissen, and colleagues described their new LEDs in a paper, Thermoresponsive scattering coating for smart white LEDs, recently published in The Optical Society's open-access journal Optics Express. 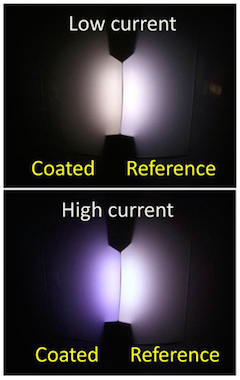 The trick is to coat phosphor-converted blue LEDs with a special material, a thermoresponsive scattering coating that behaves differently depending on temperature. The researchers used a siloxane, a "non-aligned smectic liquid crystalline material" composed of liquid crystal and polymeric components. At low temperature, this material scatters light, particularly blue wavelengths. At temperatures higher than 48°C or 118°F, it becomes transparent. Moving to a two-phosphor (red and green) arrangement, again pumped by a Nichia blue LED, resulted in a CCT range from 2,900K to 4,150K over a current range of 5-70 mA (Figure 5 in the OSA paper). "Multiple cycles of increasing and decreasing current were carried out with hardly any fatigue," the researchers wrote. The chromaticities were a bit above the black-body locus at the high end of the range and a bit below at the bottom, keeping within five-step MacAdam ellipses over the range. It seems certain that patents have been filed on this technique. I look forward to being able to drop in to Home Depot and buy reasonably priced LED lamps whose light warms when dimmed.